Columbia, Mo. (Feb. 8, 2019) — A trip to Detroit and the North American International Auto Show – one of largest in the country – provided a group of Missouri School of Journalism students hands-on work experience as well as introductions to possible future job opportunities. According to U.S. News and World Report, the NAI Auto Show is “one of the most significant events on the automotive calendar,” with thousands of news media members present. Seniors Connor Hoffman and Kyle LaHucik reported on last month’s show and produced a photo gallery for the School’s digital first, community newspaper Columbia Missourian and Missouri Business Alert, the School’s digital newsroom that publishes the top business news from across the state. Their reporting included coverage of the show as well as a profile of MU alumnus Rod Alberts, executive director of the Detroit Auto Dealers Association and NAIAS. 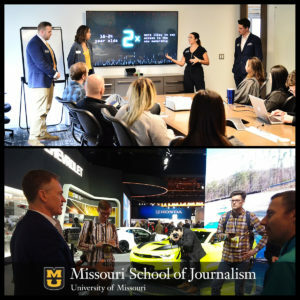 Missouri School of Journalism students recently traveled to Detroit for the North American International Auto Show and the opportunity to present their research findings to executives and communications team members at General Motors. Strategic communication seniors Megan Bartolac, Connor Hills, Ben Kochuyt, Tiffany Nguyen and Zach Seusy, who represented the student staffed ad agency Mojo Ad, visited several ad agencies including FleishmanHillard, Jack Morton Worldwide and Weber Shandwick. The students also presented to members of the General Motors communications team, including those representing Chevrolet, Mojo Ad’s 2018-19 client. Their presentation included a 25-minute “State of the YAYA” (Youth and Young Adult) report, which offers insight into the thoughts and behaviors of 18- to 24-year-olds. The journalism team, accompanied by Columbia Missourian Executive Editor Ruby Bailey, toured The Detroit News and sat in on a budget meeting at the Detroit Free Press, where they met Mizzou alumnus and photojournalist Eric Seals. Hoffman said he was able to make a connection with a staff member at the Free Press who oversees the auto-reporting department. Checking out the exhibits at the car show provided the strategic communication team with an opportunity to conduct some background research on GM vehicles before presenting to General Motors, said Jon Stemmle, chair of strategic communication at the J-School. Nguyen said the biggest challenge, for her, was memorizing the lengthy presentation. “It was a matter of practicing it while I was driving to work, driving home, in the shower,” she said. The Mojo Ad faculty members who took the trip – Stemmle and Associate Professor Frank Corridori – prepared the students for the types of questions they would be asked and how to answer them, said senior Bartolac, account executive. As the teams presented to the various agencies, Nguyen said she was introduced to the Jack Morton agency for the first time and is considering it as a career option when she graduates this May. Using feedback received during their meetings in Detroit, the students now have an opportunity to adjust the report script further. The team is getting ready to present its report to at the Journalism School Career Fest 2019 on Feb. 12 and “State of the YAYA” livestream at 11 a.m. CST on Feb. 26. Students are also working on an integrated marketing campaign for Chevrolet, which they will present to GM executives in May.